Everyone loves the classics, right? Classic cars always draw a stare. Classic rock-n-roll always brings smiles and tapping feet. Everyone still loves Lucy. I continue this morning with my Top Three Books series. I kicked the series off last time with what I thought were the top three most influential books of all time. Today, I come at you with what are my top three classic fiction books. Let me define my term, though, before I get started. By classic I mean a work of enough age that it has stood some test of time and has been recognized by multiple generations to be superior to its peers. 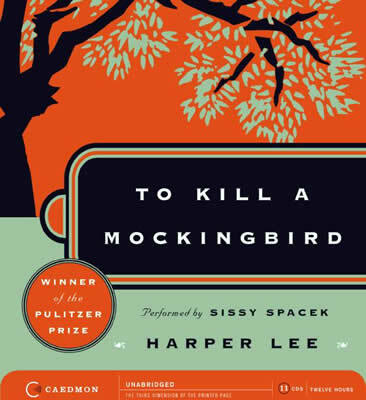 Mockingbird was the first novel I ever read that made me question my life and the injustice of the world I lived in. It also forced me to identify with other people, particularly oppressed people. I read the novel before I saw the movie, and have to say that as great as Gregory Peck is as Atticus Finch, the written words are far more powerful. As you can tell by my heading, I don’t believe for a moment that Harper Lee wrote it. She may have designed the plot or even brainstormed the characters but it was definitely her good friend and childhood buddy Capote who wrote it. Many people would not even think that Hamlet is Shakespeare’s best work. Romeo and Juliet gets more cultural thrift–with constant retellings (For a zombie Romeo and Juliet, see Warm Bodies) and King Lear is so pitied while Othello makes us all shiver with fear at our own jealousy but Hamlet, to me, is the best. It is the bard at his epoch of creative power. Most years I reread it during Lent for its themes of death and mortality. Dickens’ most famous novel is A Christmas Carol. I like that one, and even wrote a tribute of sorts to it in my first book, but there is something about the character of David Copperfield that I identify with. To my mind at least, Copperfield is more believable that Pip in Great Expectations and the book is far more enjoyable than A Tale of Two Cities, although A Tale of Two Cities has the greatest opening line ever. Let me emphasize, again, these are my top three. You can tell from the list that I lean toward British classics. That is not because I haven’t read Dostoyevsky, Cervantes, or Hemingway, because I love them all a great deal. It is simply that these three are at the top of my list. I’ll resist the urge to expand the list, although, if I did, I’m quite certain that number four would be The Picture of Dorian Gray. I’d be very interested to know what your top three classic fiction works are. I was not familiar with the Capote conspiracy theory. I do not like it, sir. Two leadership books I am reading reference Dorian Gray and encourage all ministers to read it. I had never heard of it before. I’ll have to add it to the list. yes yes, do read Dorian Gray. it is not only oscar wilde’s finest work, it is one of the deepest theological treatises ever on sin and its price. On the subject of the Capote Theory, I would add that Wikipedia strongly disagrees with you. matt, that is likely due to heavy redaction from harper lee and the harper lee family, if not downright authorship of the wikpedia page. of course i could be wrong, but i’m probably not. Okay…first of all my fine learned friend…Truman Capote? I’ve heard that riff so many times. I disagree completely with that part of your analysis. I think Scout wrote the book. It was originally a collection of short stories and this the choppy structure. That being said, I completely agree with your putting it in your list. Powerful prose. I actually have a recorded version of Sissy Spacek reading it. That is completely different vibe. 2. Lord of the Rings—Tolkien is so immersed in the Gospel it leaks out of all three volumes in such clever ways that unbelievers don’t realize it. 3. Huckleberry Finn—Ground breaking in the sense that it is the first truly American novel of any weight. well, nothing stirs you up quite like a little capote controversy, heh? your three are wonderful too. however, if i may be so bold, i like ‘the hobbit’ better than any of the LOTR precisely because it is less self-conscious. as far as huck goes, it would be on my list of top 20, i think. be looking for the owl book in posts later to come, for it makes the cut–just not on this one. thanks for reading joe, and as always, your opine is greatly appreciated. There are really two questions here, in my opinion–which three works of fiction do I think everyone should read, and which three works of fiction are my favorites? I chose those three works because they are short, accessible, thought-provoking reads that everyone can absorb relatively easily. All three communicate powerful ideas that are as relevant now as they were when first penned. My personal favorites are probably not very sophisticated or literary (except, perhaps, P&P), but again, that’s why I think there are two questions here. If I were asked to give someone a list of just three important fictional works to read, it would be the first group. If I just wanted a book for my vacation, it would likely be one of the second group. i love the first list, and can see a bent toward sci-fi in it. i will be posting my top sci-fi books at a later time and i am quite certain that mr. bradbury will make an appearance there as well. however, no list i ever make of top books will ever include anthing by jane austen. it just will not. my wife and daughters love her, but i can’t stomach it. i can see the two questions aspect, but for me in this blog post it was all about my personal favorites. for example, i think if i were rating world lit and the books everyone should read, i would not have included dickens. i just like dickens, but i would have likely bumped up dorian gray or maybe included something like farewell to arms or canterbury tales. i love the way your mind works though, and i am so thankful that you read the blog and commented. thanks! A footnote: I know that American Gods and Harry Potter are relatively young classics, but I think they’re classics anyway. American Gods is something like #11 on the top SF/Fantasy list published sometime back, and I think the test of time will prove Harry Potter just as enduring as Chronicles of Narnia. you may be right on both accounts amy, but in my accounting for this list i kind of wrote anything off that was written during my lifetime. i even worried about including mockingbird, because, compared to the timeline for other classics, it is relatively recent. however, i agree with your point, especially with the harry potter books. there is no way that they will not last for several generations. If I weren’t constrained by the “classic” boundary, I would pick Gillead by Marilynn Robinson. Can’t recommend it highly enough but it is only ten or so years old. I appreciate To Kill a Mockingbird though, but I have no opinion on Capote as author. My favorite Shakespeare is Henry IV, both parts though I confess I haven’t read Hamlet. I think if I read Les Miserables it would get into the top three but I guess I have to read it first. Also, in my dabbling, I suspect Bleak House may be right up there with David Copperfield but again that pesky requirement to read it first….So little time so many books. great pick with Gilead–that is a great book. it is recent, but i think it is certainly one of the best pieces written in the 30 years or so. she writes dialogue in such a way that it feels like action. it seems like you’re in good company with your LOTR, lots of people seem to rate those very high. All right, I’ve thought about it some more, and here you go…..
“East of Eden,” by John Steinbeck. I’m not normally a fan of Steinbeck, but this book is absolutely captivating. I loved it. There are a lot of important biblical themes and images woven throughout as well. “Far From the Madding Crowd,” by Thomas Hardy. This is a beautiful love story that captures one woman’s independent spirit and one man’s enduring patience. Very dense prose, but the story elements are fantastic. And I would keep “P&P” on there. I love Jane Austen. I love the wit and social commentary woven into her stories. As for Shakespeare, one really can’t evaluate him completely without looking at the different categories of his plays. You almost have to pick a favorite history, comedy, tragedy, and romance. While I agree with you that “Hamlet” is a wonderful play, my favorite is actually “Othello,” mainly because I love Iago. In my (not so) humble opinion, Iago is the villain standard by which all other villains should be measured. For histories, my favorite is “Henry V,” but you can’t really evaluate that one without reading “Henry IV, Parts 1 and 2.” But for the St. Crispian’s Day speech alone, I have to give “Henry V” the edge. Comedies: My *favorite* is “Much Ado About Nothing,” but I think the most important and most underrated comedy is “Measure for Measure.” I love “Merchant of Venice,” but . . . it creeps me out a bit. It’s almost a tragedy, I think. And for romances, “The Tempest.” Hands down. Finally, as to your comment about my leanings toward speculative fiction, yeah, it’s true–I definitely lean that way. But I would argue that there’s not much speculative about any of my choices anymore. “1984” is coming true before our eyes. And “Fahrenheit 451” isn’t about censorship–it’s about the Snookification of our culture. Which . . . Yeah. Coming true before our very eyes. And “Frankenstein” . . . um, cloning and stem cell research, anyone? oh my goodness what a great follow-up list. love all of those. as to speculative fiction, i couldn’t agree more about the almost prophetic tendencies of those who wrote about the future. another i would add to your list is brave new world. huxley seems almost clairvoyant in his depiction of so much of modern life. you’re right, this is a great conversation. there are few things more enjoyable in the world than bookish people talking about books. Oh, I do like the Tempest, though performances of it seem to always disappoint. The video of Much Ado about Nothing with Denzel Washington etc was simply excellent as was the video of Midsummer Night’s Dream. Measure for Measure I am not familiar with, thus confirming your point Amy. Steinbeck also seems to always disappoint, but I did enjoy East of Eden. For Thomas Hardy I really like The Mayor of Casterbridge best. For speculative fiction, let me recommend Ursula LeGuin, though her stories tend to be very grim. The science fiction I enjoy by far the most are the young adult books by Robert A. Heinlein, like “Have Space Suit, Will Travel” or “Tunnel in the Sky”. He left me behind when he wrote Stranger in a Strange Land. i saw a performance of the tempest for shakespeare in the park about 20 years ago that was really good. the problem with the tempest is that producers and actors always present it as a love story, but it is really a story about growing old. at least, that is what i think. I agree with you–The Tempest is about aging and a new generation (hence the temptation to make it a love story). Plus, it’s called a Romance, but in the words of Inigo Montoya, I do not think it means what they think it means. wow–you just quoted the princess bride in a conversation about shakespeare. i would think that is inconceivable. well played.